An online comic…where YOU play a role??? It began in 2003 as little more than a dream, a crazy idea to tell a story in a new and different way. What if the fictional characters of the story you were reading suddenly began to contact you, through phone calls, email and instant messages, and even at actual real world meetings? What if they presented themselves as real and involved you in their lives and struggles, so that you actually changed the world in which they lived? What if there were items that you found or that arrived at your home that were important to those characters and their stories, and vital to the things they were trying to achieve? It began with a story told many times before, an ironic tale of a wish gone wrong, and one man’s quest to set things right again and regain his life. His struggle and the power of his belief attracted thousands of online helpers to his side, in an experience that changed many who participated in it forever. 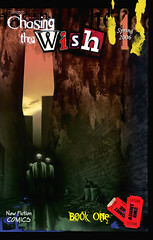 Starting in February 2003, over 10,000 people discovered Chasing The Wish in its original incarnation as a piece of interactive fiction called an ARG or Alternate Reality Game. Chasing The Wish provided real time, immersive interaction for over six months, incorporating dozens of fictional websites, characters, and real world items and interactions, while attracting international media attention and coverage from the BBC News, the NY Times, and many other major newspaper and magazine sources. Since 2003, the creator of Chasing The Wish – Dave Szulborski – has become an influential force in immersive marketing and entertainment, with his games, stories, and puzzles playing key roles in several critically acclaimed and award winning marketing campaigns. Dave was part of the creative team behind the MIXX 2005 Campaign of the Year, the Audi cross media event called The Art of the Heist. In 2006, Dave has already designed interactive elements for international marketing projects for General Motors, Hewlett Packard, and a major feature film for Dreamworks. His book about Alternate Reality Games, This Is Not A Game, is widely recognized as the authoritative reference source about ARG history, emergence as a genre, philosophy, and game creation. This entry was posted on Wednesday, April 26th, 2006 at 5:32 pm and is filed under Uncategorized. You can follow any responses to this entry through the RSS 2.0 feed. You can leave a response, or trackback from your own site.